New ONE TOUCH External Backup Hard Drives make simple backups easy. Email is becoming a great time-waster for many offices due to SPAM. There are a number of solutions available including new Anti-Spam appliances. Is YOUR office wireless yet? With laptops, Smart Phones and Hand-held Pocket PCs more and more offices are going Wireless. How would you like to be able to send a fax from your desktop computer? Prepare your business for the future and learn how the right small business software can help you stay connected, enhance security, and improve productivity. You can purchase the top-rated Spy Sweeper software directly from our website. Also, learn about three free (for consumers) antispyware programs that are available from top companies within the antispyware industry, including Microsoft! The free antispyware software is great for home PCs but what if I have a company with many PCs that need protection. Learn about our enterprise level antispyware protection here. You can purchase and download the full line of Symantec consumer-level (Norton) antivirus and security suite software packages ranging from the popular Symantec AntiVirus as well as other popular titles such as Symantec Security Suite, Symantec EndPoint Protection, and Symantec CLOUD options. Learn about our recommended enterprise-level antivirus solution, the Symantec EndPoint Protection Small Business. Anti Virus and Anti Spyware - Provides unmatched, Best-Of-Breed Malware Protection, enhanced Spyware Protection, new Rootkit Protection. We can provide custom written web-based (HTML) courses for your company on just about any topic. Why not have new employees complete an online course on your employee handbook. We can even have them take a test at the end to see how much they retained. Additionally, we can provide one-on-one or classroom style training on any product we sell. We can also provide custom designed training to fit your specific needs. How important is your company's information system to the success of your business? Learn about our recommended data protection solutions. See our disk / partition imaging software products (BootIt, CopyWipe, Image for Windows & Image for DOS), which allow you to create a backup image of your system. SyncBackSE is a powerful file level backup and restore program. Also, see our other great products such as Spy Sweeper, Windows Washer, Pop-Up Washer, and PC TimeCop, the parental control software. Call 225-753-0297 for information on how to order! Symantec Mail Security 8200 Series Appliances. Designed to Protect from Unwanted Spam & Virus Threats - Integrated Antispam, Antivirus & Email Firewall Technologies to Prevent Malicious Attacks - Recommended Organization size: Med-to-Large, 1000+ nodes. Wireless G Access Point with SRX. The Linksys Wireless-G access Point with SRX lets you connect Wireless-G (802.11g), Wireless-B (802.11b), and new SRX-enhanced devices to your wired network so you can add PCs to the network without the cabling hassle. 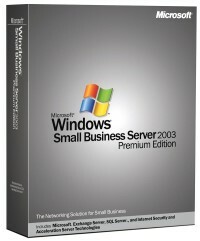 — Windows Small Business Server 2008 comes complete with a desktop fax server! Send and receive faxes right from your desktop. Plus - incoming faxes can be received via email in addition to being printed out automatically on which ever printer you designate. Faxes can be posted on the CompanyWeb for easy viewing.